There's no such thing as magic. The Doctor will be the first person to tell you that. But his eighth incarnation does enjoy a good magic show. If nothing else, it gives him a mystery to solve trying to figure out just how the tricks are done. 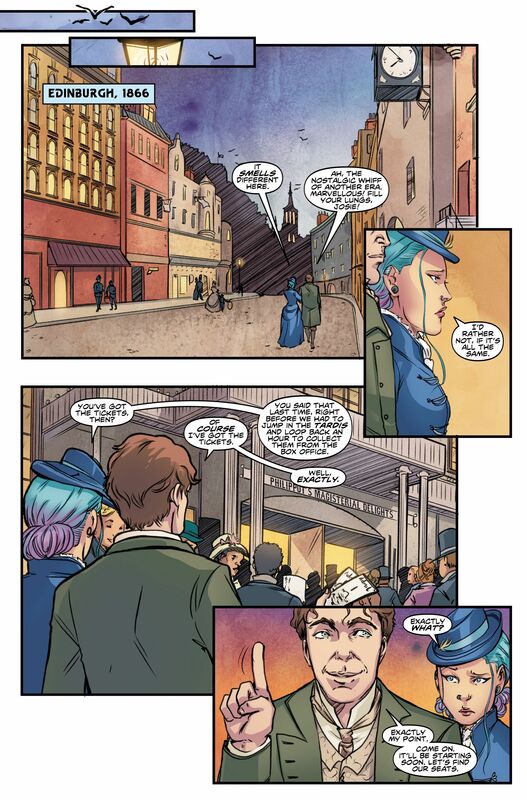 Yet the mystery The Doctor and his current companion Josie Day uncover when then attend a Victoria era magic show will involve unraveling more than simple conjuring tricks. For the magician known as The Silversmith seems to be changing the people who travel through his magic mirrors...and stealing their reflections! George Mann easily matches Steven Moffat as a writer. At the very least, the two are equals in the field of "taking an irrational childhood fear and building a horrific story out of it." As The Weeping Angels play upon our fears of statues coming to life when we aren't looking and taking people away, so too does The Silversmith play upon our fear and fascination with our own reflections. The science of how this is possible is hand-waved somewhat but no more than the "magic" in classic Doctor Who tales such as Battlefield. The art by Emma Vieceli is a delight. Vieceli fits an amazing amount of detail into her panels without anything ever seeming cluttered or overdone. And the colors by Hi-Fi lend an extra level of vibrancy to Vieceli's lively work.